A Chinese zoo was caught trying to pass a dog as an African lion, among other mismatched critters. This week it was revealed that the creature dwelling within the “lion’s” cage at the People’s Park in Louhe city of China’s Henan province was not, in fact, from anywhere remotely near the Serengeti Plain. It turns out that the animal was none other than a large mastiff from the much closer plateau of Tibet. Although one might think that the canine’s size and general appearance would have given it away, it was not until the dog barked that visitors questioned zoo staff about the suspect animal. A mother made the discovery when she took her son to learn what sounds different animals make. When the creature let out not a beastly growl, but a bark, it was clear they had been cheated. When confronted by angry visitors, a zoo official explained that the dog was a pet of one of the zoo’s workers and had been placed in the cage to stand-in for the bona fide lion that was away at the breeding center. According to the zoo’s Liu Suya, the canine substitute was needed due to safety concerns, the Beijing Youth Daily reported. The dog was not alone. Apparently other species at the zoo were also mislabeled, including a white fox filling in for a leopard and another dog substituting for a wolf. As expected, China’s Weibo users pounced. “This is not funny at all. It's sad for both the zoo and the animals,” said one. “They should at least use a husky to pretend to be a wolf,” added another. 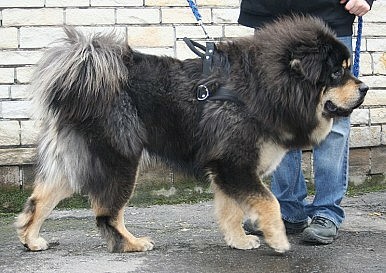 There is a vague resemblance between the African lion and the Tibetan mastiff due to the latter’s long hairy coat and what appears like a “mane” on many of the dogs. While a lion may have been what visitors to the park hoped to see, the mastiff is a rare beast in its own right. In China, the large dogs sell for upwards of $750,000 a piece and have become status symbols of the nation’s nouveau riche. In 2011, a red mastiff named “Big Splash” sold for an astounding 10 million yuan ($1.5 million) – at the time the most expensive dog ever sold.